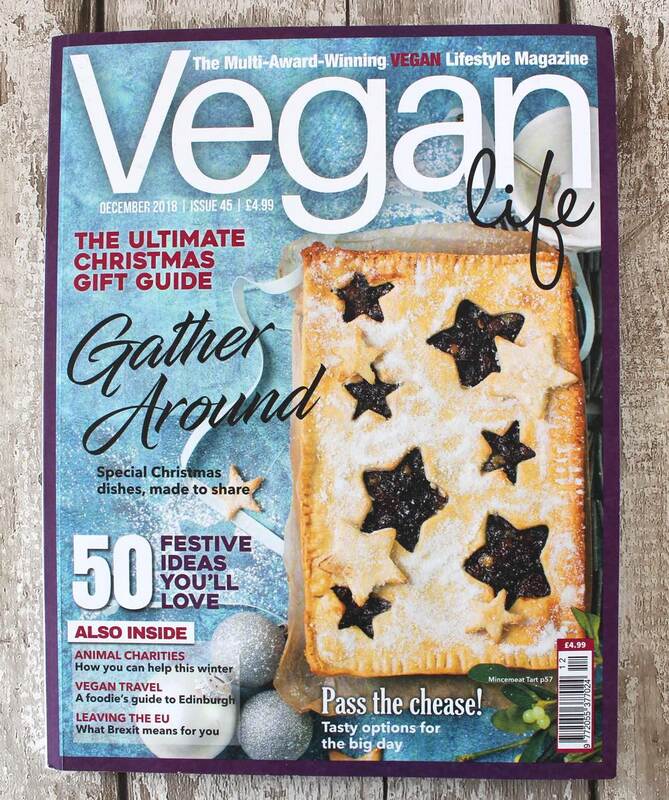 The inspiration for today’s recipe was the December issue of the Vegan Life magazine. 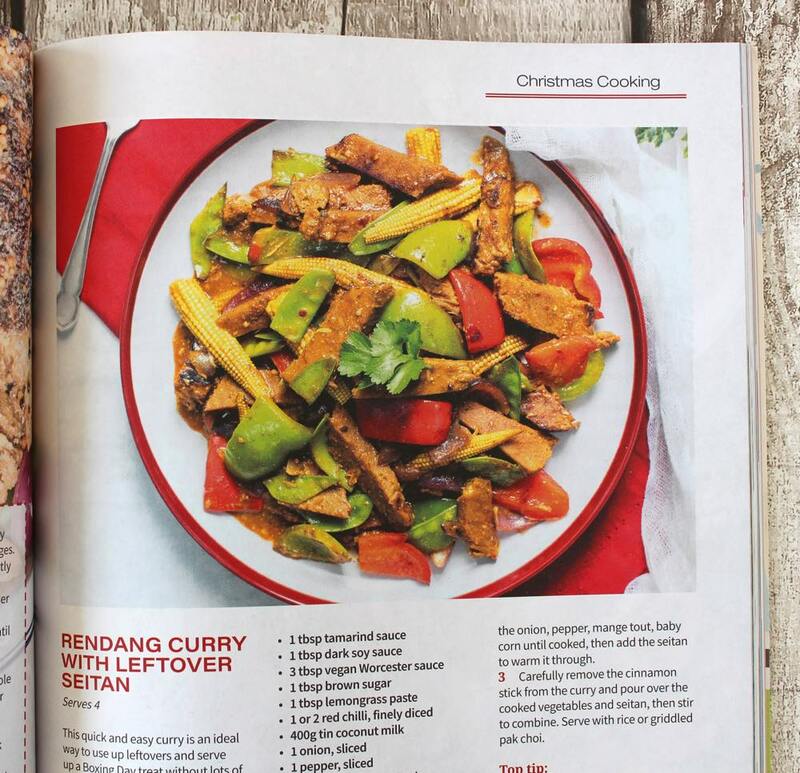 It might seem a little unusual to have a curry recipe featured in the Christmas cooking section, however I totally get it. While I enjoy indulging in the traditional festive fare, it’s not long before I start to crave lighter, more nutrient-rich dishes, just like this Thai curry. Quick dinners with minimal preparation are also high on my list during the festive season as I want to maximise my time with the family, rather than slaving away in the kitchen preparing food and washing up. While the original recipe includes a curry paste made from scratch, I decided to cheat and use a shop-bought paste for speed, convenience and cost. When it comes to Thai curry pastes, I find that that shop-bought versions tend to work out cheaper than buying the individual components, like lemongrass and kaffir lime leaves. 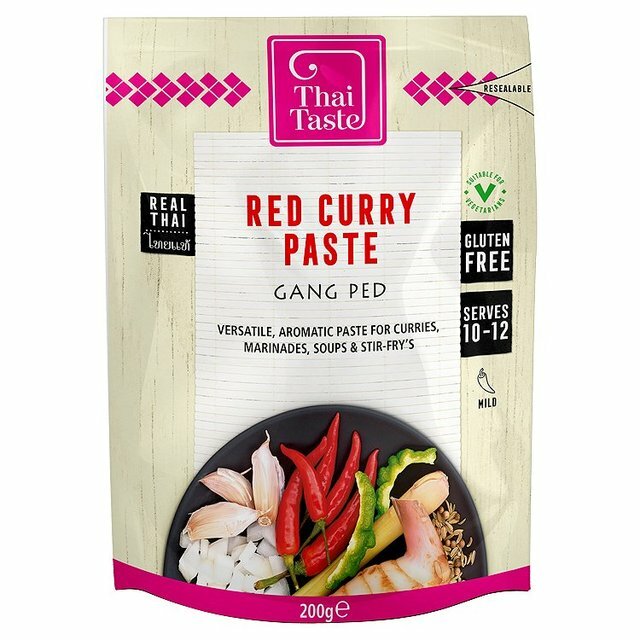 My current favourite brand of red curry paste is Thai Taste, which is made with fresh ingredients, including red chilli, lemongrass, galangal, and kaffir lime peel. Unlike other brands of Thai curry paste, this one is suitable for vegans as it doesn’t contain dried shrimp or fish sauce. The Thai Taste red curry paste is classed as ‘Mild’ but I still find it pretty hot. Older children may be able to handle the heat but for younger children, I would recommend making a mild curry Thai paste from scratch (like the one featured on p111 of the Bit of the Good Stuff cookbook … it’s mild, but still full of the lovely, fragrant spice flavours that we associate with Thailand). 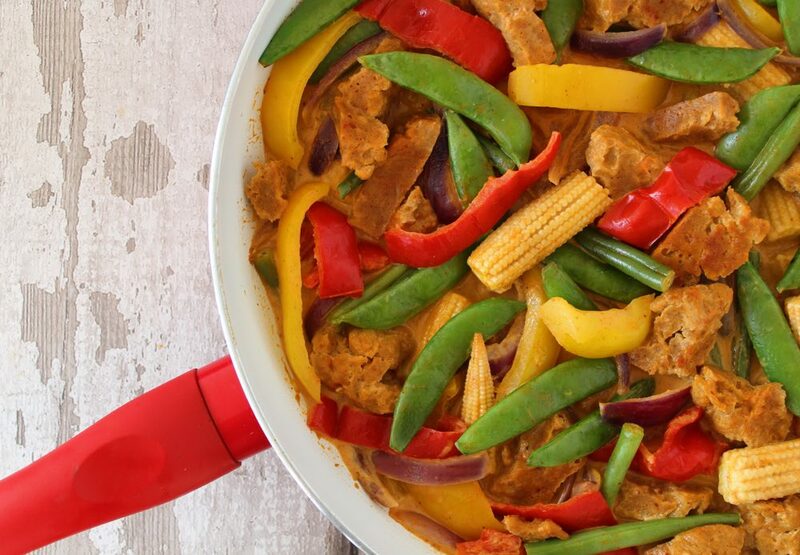 This Thai red curry is packed full of beautiful colours, textures and flavours. 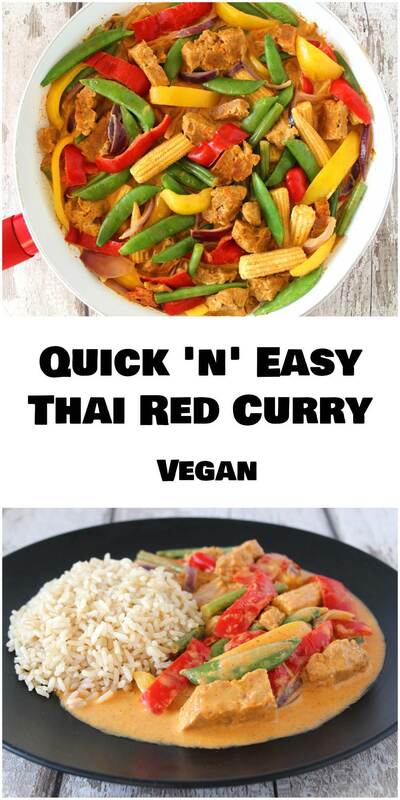 It’s quick and easy to prepare, making it the perfect ‘fast food’! 1. Gently heat the oil in a large deep-sided frying pan (skillet). Slice the onion and add it to the pan. 2. Slice the peppers and add them to the pan. 3. Add the Thai curry paste and about a quarter of the can of coconut milk to the pan. Stir until the paste has dissolved into the milk. 4. Add the seitan or other meat-free alternative, the fine green beans and baby corn. Bring to the boil then reduce the heat and simmer for 7 minutes. 5. Finally, add the sugar snap peas and continue cooking for a couple of minutes until warmed through. 6. Serve with a whole grain like brown rice, quinoa, whole-wheat couscous or some granary bread. Any leftovers can be stored in the fridge for up to five days. Wishing you all the very best for this holiday season and the upcoming New Year ✨ May it be filled with peace, good health and happiness! Yum! 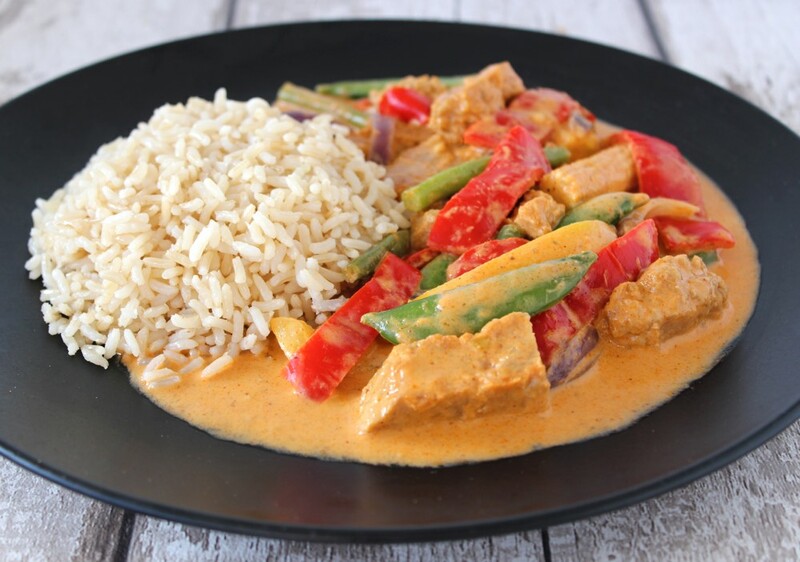 Red curry is one of my favorite foods and this one looks fantastic! This looks so simple and delicious! We all need a few quick and easy go-to dinners just like this–and all the better if it has curry. Thanks for the recipe! 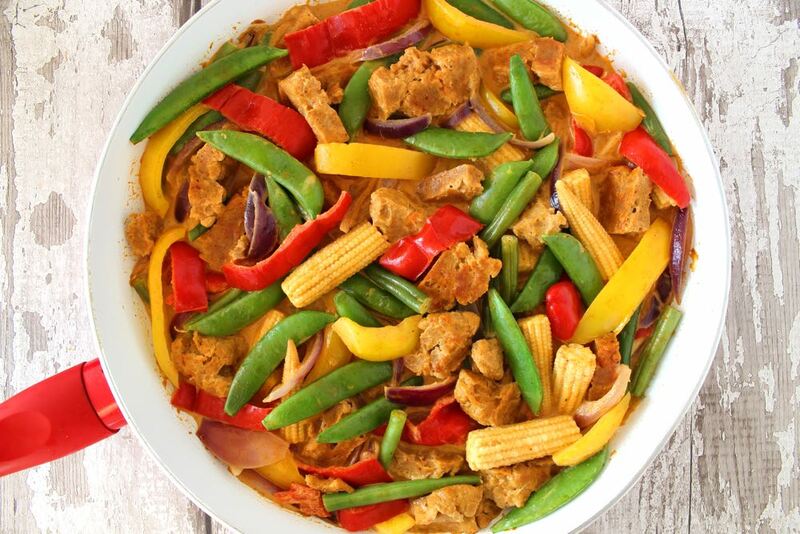 Ooh I love a good Thai curry and this looks amazing! So simple and quick and full of protein and good fats and fibre, get in ma belly now!